Iran might have an Islamist government, but aside from the Revolutionary interlude, average Iranians have never been generally inclined towards fundamentalist orthodoxy. This disconnect will deeply confuse a young devout Muslim woman in Canadian-Iranian filmmaker Parisa Barani’s short Ablution (trailer here), which screens in a slightly revised form during the 2015 Mill Valley Film Festival. Neda Enezari’s mother Afsenah makes no secret she was a “mistake,” While the pious twenty-something openly regards Afsenah’s second marriage as a sin. Neda’s brother Omid reluctantly serves as a buffer between them. He is much more modern in his thinking, but he still respects his sister’s religious devotion. Tensions are already high, with the Iran-Iraq War rudely interrupting everyday life on a regular basis, but the Enezari family’s declining fortunes makes everything worse. Resenting her unhappiness, particularly since she represents the Islamic Revolutionary ideal better than nearly everyone around her, Neda Enezari will start to make a series of unfortunate decisions. It should be clearly noted Ablution portrays the fundamentalist Enezari in profoundly respectful terms. It also finds considerable value in religious observance. However, it is hard to think the ruling theocrats would consider the film to be good for business. Rightly or wrongly, Enezari’s stringent faith is isolating and alienating in practice. The symbolic interludes inspired by Sufism probably would not sit well with the Shia powers-that-be either. Although not a primary focus of the film, Barani and her co-writer-co-stars Melissa Recalde and Amin El Gamal also give viewers a sense of the corrosive fear and paranoia instilled in common citizens by the state and its notorious Basij morality militia. Recalde plays Enezari with admirable restraint and sensitivity, but it is Amin El Gamal who probably earns the “breakout” honors as the conflicted Omid Enezari. More than just a nice guy (always a tricky role to play) or an audience surrogate, he really embodies the heart of the film’s religious and social anxieties. Barani’s short offers an intimate look inside a middle class Iranian home, challenging some preconceptions and confirming others. Revisiting it in its ever so subtly revised form, one is struck by Neda’s confusion and bitterness that her fervor is not rewarded, while the impious around her apparently lead happier, fuller lives. Watching Ablution, one starts to understand how this gap between the promises of fundamentalism and the material benefits of modernity leads to anger and potential tragedy. Indeed, Ablution is provocative in ways we can only obliquely hint at here. 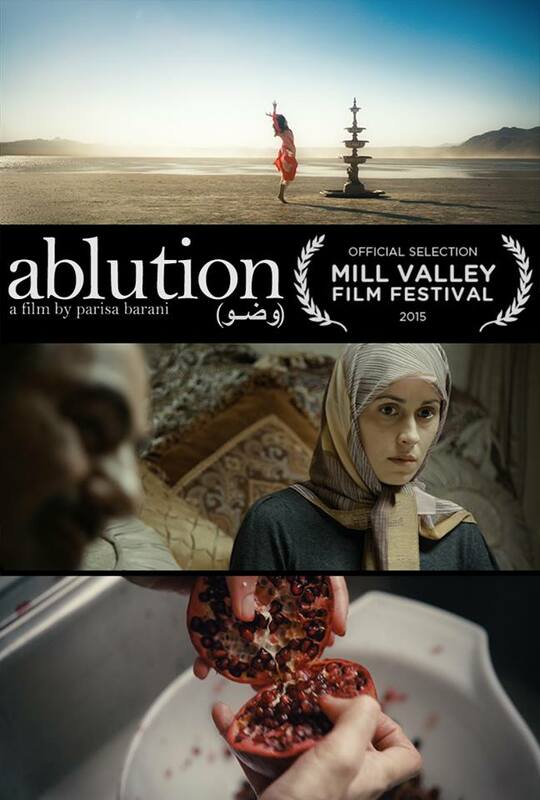 Highly recommended for those who appreciate Iranian cinema and Persian culture, Ablution screens tomorrow (10/16) and Saturday (10/17) as part of the 5 @ 5: Brand New Me short film programming block at this year’s Mill Valley Film Festival.